Dots Dashes Doodles & Dreams: Same Magnolia Stamp - Different Card! Same Magnolia Stamp - Different Card! Hello All - I've had another pay with my one and only Magnolia stamp, but this time I've gone for an easel layout. The paper is the Gypsies Sister range from Kaiserkraft and actually came free with some other embellishments in the latest copy of Simply Homemade. I distressed the edges of the paper with "Antique Linen"I and added a few larger flourishes, some adhesive pearls and a cream satin bow. I also added some "Doohickey" flowers (which were also distressed) that I purchased from good old E-Bay! Hope you like it - please feel free to leave any tips or comments! Ohhhhh, how beautiful!!!! Love the colors and all the darling details and, of course, Miss Tilda is stunning! Such a pretty card. I love the color scheme. Very cute card! I especially love the swirls and flowers! OH STUNNING AND THE COLOURS SO RICH!! Oh your right on hun!!! Beautiful card! Love the DPs, layout, flowers! Very nice. Congratulations on a beautiful card. Stunning card! 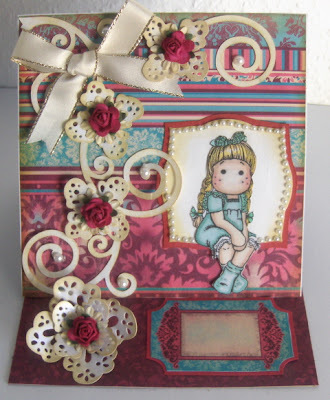 I love the embellishments you have used and the colours are gorgeous. Really very gorgeous card. Love the colors and lay out. Very pretty! Love those Dohickey Flowers!! Sweet and love the color scheme on this Tilda card!! A really cute card Debs. Oh So Pretty!!! You did a fantastic job on this card! Oh how pretty! I love the colors and your fabulous details!! Is It a Card?Is It a Gift? ... It's Both! A Little Something Just For Me! My First Dip Into the Magical word of Magnolia!